A new educational robot kit has been created by EngiMake a team based in London, which has been specifically designed to enable almost anyone to learn more about coding, electronics and walking robots. The QuadBot robot is available in a number of different kits allowing you to either 3D print your very own casings and legs or simply purchase a complete kit with everything you need straight out of the box. Watch the demonstration video below to see how the DIY QuadBot robot can be constructed and then controlled using Scratch or similar from your smartphone, tablet or computer. 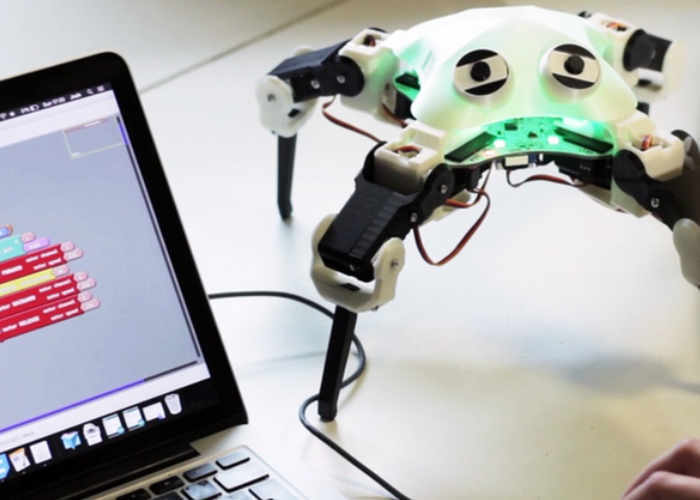 QuadBot can walk, dance, light up and with sensors it can follow you, avoid obstacles, play songs… anything is possible! But the real value is the open-ness of QuadBot. Rather than limit you to only a few behaviours, we’ve opened up the entire code and design so you can hack it to do anything. That means if you want to learn basic robotics, you can follow our standard guide, but when you’re ready to activate super maker mode, you can break-out and use QuadBot to explore robotics. Do you want to 3D Print your own robot or do you want a robot ready out of the box? Do you want to get them early or in bulk? For more details and full specifications jump over to the Kickstarter crowdfunding website where QuadBot is available to back with pledges starting from just £123.